The Word Study: Defining a Biblical Worldview — The word study involves more than going to a dictionary to define a word. It is the method of scholarship that puts the student on the pathway of developing the habits of reflective thinking and deductive reasoning from Scripture. The word study places the truths of God’s Word at the center of all learning, which illuminates the understanding and consecrates the mind. Research: The word is defined, using Noah Webster’s 1828 Dictionary, key words are identified within the definition, and the key words are defined. Each word is then researched using a Bible concordance. Reason: A definition of the word is written in your own words. Relate: Application of the definition and the Biblical principles deduced are written, according to the intended purpose and your own life. These 4 steps are commonly known as 4-R’ing in the world of the Principle Approach® and can and should be a tool used by both teacher and student. I will be teaching Ben this method of learning, and some weeks, I’ll blog his word studies as well. You don’t have to be a Principle Approach® homeschooler to do word studies. Obviously, it’s a great tool for everyone!This week, I introduced the word study concept to Ben. We worked on the word together, with me really doing most of it, although he did have input. My goal is to continue working with him until he is able to begin doing them independently. 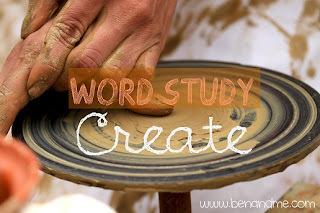 Our word for study is CREATE. Create: verb transitive: to bring into being from nothing. to cause to exist. to make or form. to generate. to bring forth. to form anew. bring: to draw to; to attract or draw along; to cause to come. nothing: non-existence; a state of annihilation; not any thing. exist: to be; to have an essence or real being. to have life. form: to shape or mold. to plan; to scheme; to modify. generate: to produce a being similar to the parent; to produce; to cause to be; to bring into life. anew: over again; another time; in a new form. To create is to cause something that was once non-existent to have life. It is the act of shaping and molding something into being, that did not previously exist. Ben and I have been working on some homeschool ideas for art class. It’s obvious looking around us that God is a creative God. And because we are created in his image, we must be creative, too! Doing this word study, we both got the sense that more important than creating is realizing that we were created. We were created because God wanted us here to praise Him. He gave life to us, two people who did not exist and would not if it were not for Him. And He didn’t just create us and then leave us to fend for ourselves. We are His workmanship and just like an artist fine tunes his work, God is fine tuning us. He continues to create (shape, mold, plan, scheme, give us new form) daily, in our earthly lives and within our hearts. « Online Thanksgiving Co-op starting soon . . .